Fibonacci Retracement Technique proved to be the best and simple technique for day trading. If the price action is rising in nature but in between some correction brings down the price and again escalate to higher levels then we can this Retracement as a growth Retracement. The cause of growth retracement is due to profit booking, short term correction or portfolio churning by Institutions. If the price action is in falling in nature but in between some technical bounce back. or relief rally happens due to short covering then we classify this as a decay Retracement. The cause of decay Retracement is a correction, technical bounce back or relief rally. If the price finds support at 50% of retracement of its prior swing of up move or resistance at 50% of retracement of its prior swing of down move then this retracement is called bounce back price zone. Say nifty has fallen from 4700 to 4500. The prior trend of this 4700 high was a rising trend started from 4000 then it is classified as growth retracement. Taking the 50% retracement of this high low movement of 700 points to 350 I will say if the price finds support at 4350 then uptrend will resume and has high probability of crossing the previous high. Now the next big question is how do I will know that 4350 support is a valid support or is a mathematical eye wash for me. Support must be validated by the volume. By simple observation if I will find the fall below 4350 invites buying and escalates the price to bit higher level then I will conclude this price is a valid support. Death Zone or trend reversal zone: In retracement principle if the price retraced more then 61.8% of its prior swing then it has remote chance of going back to its prior trend. Range bound or consolidation zone: if price finds support or resistance at 38.2% retracement or never crossover the 38.2% level from the50% retracement then I can classify the retracement as a consolidation zone. Every morning when market wake up the stock or indices make some high and low by taking the high low difference with the help of above discusses ratios we can make fantastic trade decision. Say at one point of time I found Nifty future is trading at 4565 and at that particular time the high and low recorded for the day is 4625 and low 4530. The high low difference is 95 points. This retracement happen in a raising trend henceforth the price point 4577.50(50% retracement) will act as a support or buy entry point for the long traders. The 61.8% retracement price from the high this is 4566.29 will act as the Death zone entry point. 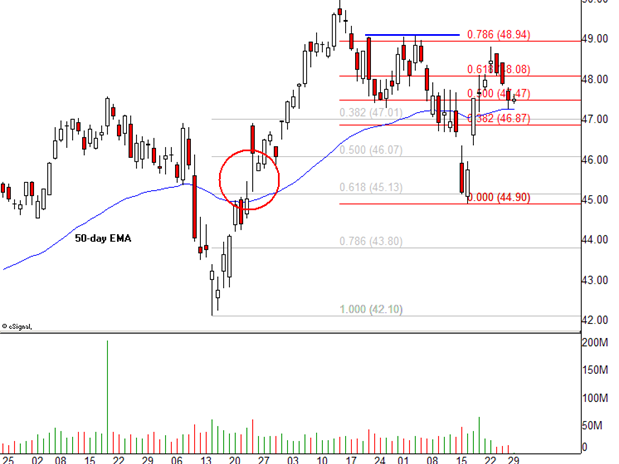 If the price falls below that then it will achieve its 1st target at 78.6% retracement down side from the high. 78.6% works as the 1st termination point of the death zone. After which the free fall to 1.618% of retracement is expected. Since the current price is in the entrance point of the death zone I will advise you to sell nifty future keeping the 50% retracement price 4577.50 as stop loss for target 4550.33 the next free fall target will be 4471.29. Consider the case if Nifty is trading at 4580 which is in the entrance of the bounce back zone I will recommend buy with stop loss 4566.29 for 1st target at 4588.71 the free raise target will be calculated from the low 4530 with ratio 1.618 on price range 95 having the termination at 4683.71. What will be the next calculation method if these free fall or free rise price point penetrate successfully? You need to apply the parallel projection or growth projection principle which you can find on my book on Fibonacci Method. The study of fibonacci method will not get complete without studying the clusture, and phi ellipse. same way the fibonacci fan line also the finest tool one can use for short term trend analysis. you can get many more successful examples on fibonacci method success in real trade practice under the section my experiment on fibonacci method. The key success in fibonacci swing trading technique is totally depend on you. you must understand the growth,decay retracement procedure. After which you can make an insight investigation where the current price is? if these two decission of your are in right path then i am 1000% sure that you will win that trade. Many traders made the mistake in those two dicisive steps.The most common mistake the trader does is they buy at the death zone of growth retracement and sell at the death zone of decay retracement.